Drill two holes and cut the threads, prepare the surface, place the strain sensor and tighten both screws to the specified torque, then set the zero point and now the strain measurement can start. If only it were that easy! Of course, the procedure described for force measurement with strain sensors works: The strains acting are measured following screw-mounting. Whether the measurement at the selected location makes sense, however, is another question. In some applications, such as the supports of a silo, the selection of the measuring point is, of course, easy. In other applications, such as impact crushers, the determination of the measuring point is immediately more difficult. First, to summarise, a short explanation of the term: Strain sensors are also referred to as strain transducers and are a special form of force sensors. Since they are screwed to the application from the outside, they are easy and quick to mount. However, they do not measure directly in the force flow, but instead they measure indirectly. Nevertheless, high accuracies can also be achieved. Strain sensors are used when deformations due to external forces must be detected on existing (mostly solid) elements. As already described, the sensor is attached to the component and adjusted accordingly and then starts to measure. The strain is transferred by frictional connection from the solid element to the strain transducer. The applications for these sensors are diverse, with two examples presented in more detail below. Silo weighing systems are typically used to determine the amount of material that is to be emptied into a truck. Often it is also important to know how much material is stored in a silo at any one time. If such weighing systems are planned from the start of the design of the silo, the weight of the contents can be determined with a very high accuracy. For this purpose, shear beams and bending beams can be provided in the feet of the silo. But what if the silo or tank is already standing and the weighing or level system must be installed afterwards? An upgrade to bending or shear beams for force measurement can then quickly become very expensive or even impossible. 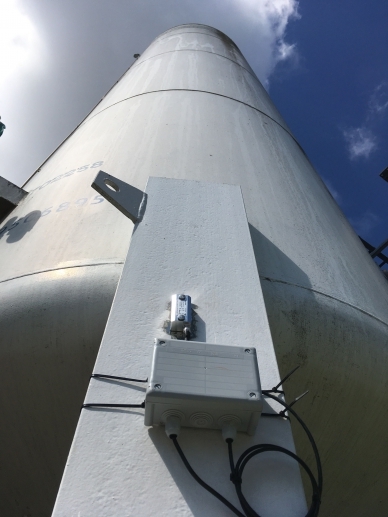 Strain sensors can be retrofitted to silos or tanks. The measuring instruments are simply screwed to the supports, since strain sensors – as described – are designed for applications in which deformation by external forces acting on an existing component is to be measured. If one knows the deformation of the columns, it is easy to estimate the level of the silo. Another example of the use of strain sensors is in impact crushers. Impact crushers are machines used to crush material, such as stones. These are broken by ‘impact crushing’ into smaller and smaller parts. As a result, stress spikes occur, which in turn deform the material of the container or machine. The resulting strains can be detected using the strain sensor. If the strain becomes too great, for example if a stone gets caught in the spindle, the system can be automatically switched off. Again, the impact crusher does not need to be redesigned, the strain sensor can simply be screwed onto the right place and it will subsequently detect the occurring stresses. In most cases, the location where the strain sensor is best placed is determined by FE calculation (so that the strain is within the specified limits). The “finite element method” (FEM) splits solid bodies into a large number of small subdivisions (a finite number of elements that are not infinitely small) for the investigation of strength and deformation. Their behaviour individually is easier to calculate than that of the entire, complex body. The basis for the calculations is the solution of multiple differential equations. In summary, it can be stated that, if one plans to do it from the beginning, there are more-exact measurement techniques than the strain sensor, which only measures indirectly and not directly in the force flow. However, if the system already exists, the strain transducer is a cost-effective alternative that can still deliver reliable measured values. In application itself, the sensor is quickly integrated and is suitable for both static and dynamic tasks. Furthermore, the sensors have a high shock and vibration resistance and good long-term stability. 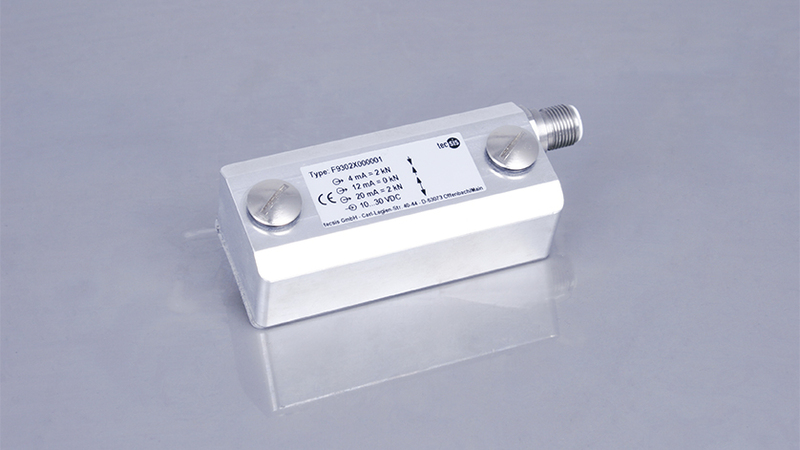 The output signal can be supplied as 4-20 mA, 0-10 V, CAN or CANopen. You can find information on our universal, versatile model F9302 strain sensor as well as on our shear beam model F3831 and bending beam model F3833 on the WIKA website.